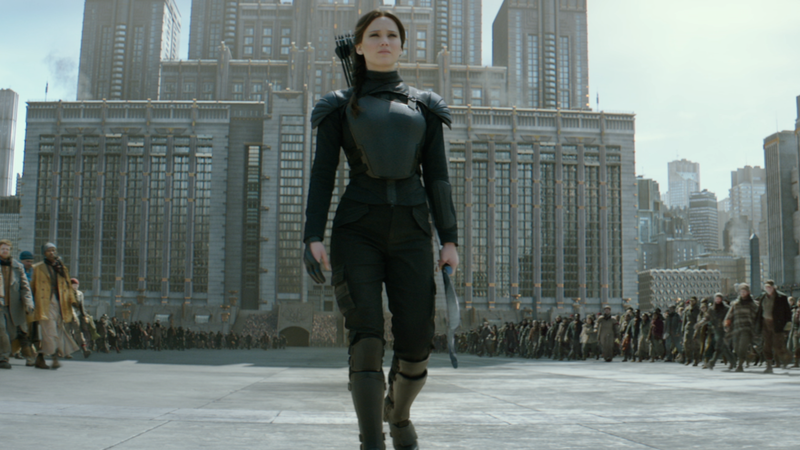 I promised we’d make a post about The Hunger Games: Mockingjay, Part 2, so here we are! I went to watch the movie last week, and let it sink it for a couple of days. I think I’m ready to talk about it now. I’m too tired to do a spoiler-free post, though, and it’s not like we’ve done a lot of those anyway. So here’s your Spoiler Alert! Handle with care if you haven’t watched the movie. But, seriously, there’s a book, people. And it’s been out for a while. Now, if you haven’t read that either, and read this post, and complain about spoilers, then that’s on you I think. And now that I’m done pointing fingers and making snappy remarks that probably sound like insults on paper (or a screen, in this case), let’s do this! Let me start by saying that I read the books (we both have). To be more specific, I read the books shortly after the first movie got out, while on vacation with my family. At the time, I was as old as Katniss, and my sister as old as Prim. I’m telling you this, because it’s important to my reactions to both the movie and the book. Okay, so… I’m going to try and skip the whole recap part of this post, because, again, I’m tired, and there’s a book, so there’s no huge revelations that really need to be discussed. But then again, I’ve tried skipping that before and haven’t succeeded yet, so we’ll see. I’m sorry – I tend to write too much and get into too much detail. I always have. Mockingjay Part 2 sets off pretty much where Mockingjay Part 1 ended. I don’t think there’s more than a couple of days between these movies, which is good, because there wasn’t in the books. So Katniss is in the hospital with crushed airways and vocal cords, they’re taking off her neck thingy (sorry, I have no clue what those are called in any language…) and slowly making her use her voice again. I liked that they didn’t skip any of that, although they did speed through the whole recovery business. But that’s understandable. And Suzanne Collins did that in the book, too. 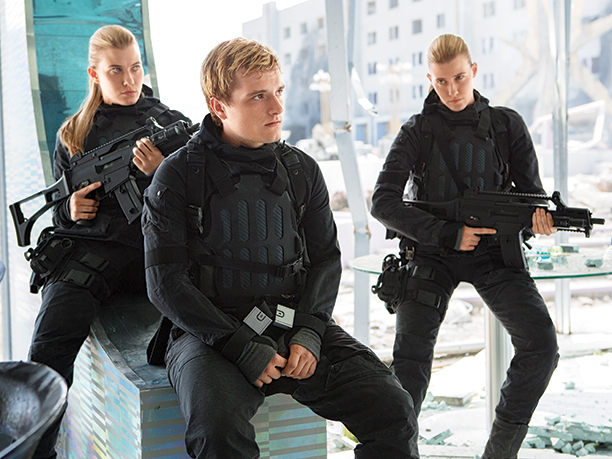 Peeta is still far from being back to normal. 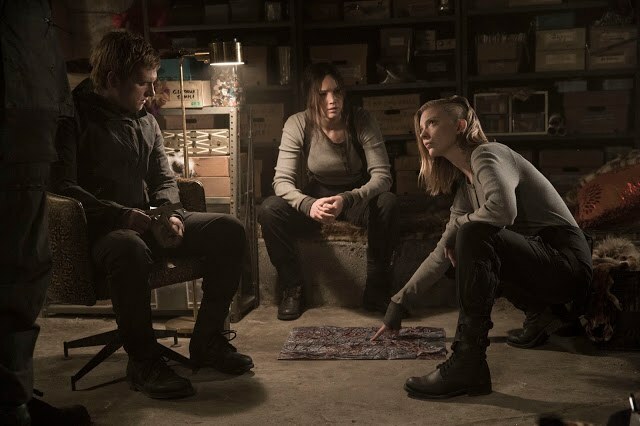 They’re still keeping him restrained and isolated, but trying to see if he may react differently to someone he trusted before the highjacking – someone that isn’t Katniss, of course. They changed that from being a girl he went to school with (Delly) to being Prim. I think it’s totally okay that they did that, because we know Prim; another character would have had to be introduced first, and just throwing characters at the viewers is rarely a good idea. Plus, it gives Prim more screen time, and I’m totally down for that, because I love her character, and Willow Shields is amazing. Ups, here I go again with the details. But I needed to recap this to introduce what I want to say next: they changed a couple of things, but I got why they did it. In the book, a lot of things happen at the same time, or one thing after the other, and at times, it was hard to keep track. So the fact that they cut out the whole training to be a soldier thing was fine by me; it would have just made the movie longer, and wasted time. 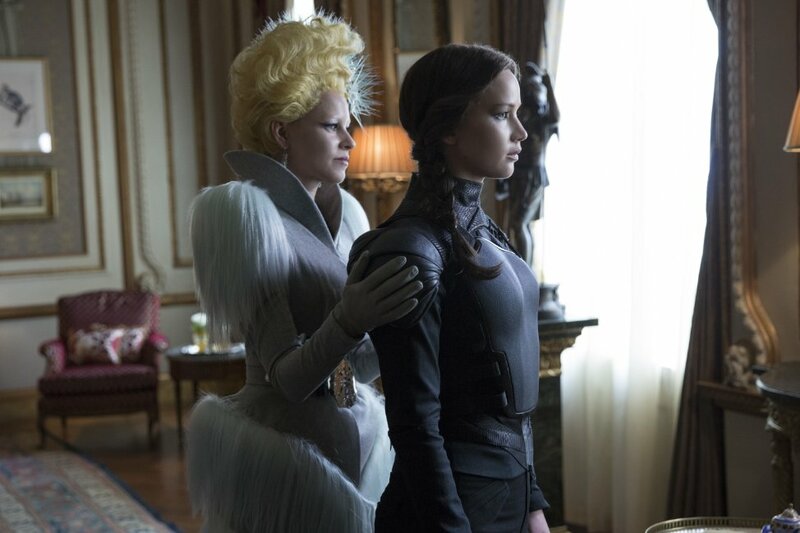 But by leaving that part of the story out, they pretty much cut out Johanna. She only appears two or three times in the whole movie, which is sad, because she’s an amazing character. But I get it. It also needs to be said that I understand why people say that there’s some pacing issues with this movie. There kind of is, but I don’t really think that’s the movie’s fault; that’s pretty much entirely on the source material. Mockingjay was a mess, when you think about it. I mean, don’t get me wrong, I loved all the books, but Mockingjay was all over the place – which is why I understand why they made two movies of it. But it still looks like there’s some problems with the pacing, because there’s moments when sh*t is going down, and then others where it’s strechted out and they try to push in some character development and it feels like the movie is slowing down. It takes away from the movie, which is sad, but I really do believe that that’s because they tried to respect the source material as much as possible. That’s the next thing I want to address: they really do respect the source material, for the most part. Yes, they’ve changed a couple of things, but it’s a movie! It’s absolutely impossible to turn a book into a film without making a few changes. And all of these movies pretty much did the best they could – especially Catching Fire, Mockingjay Part 1 and Mockingjay Part 2. The Hunger Games is another story, but that was another director, too, so I’m going to blame him (a little) – and except for the latter, the movies are 98% the same as the books, which is amazing, and other movie adaptations should really take notes on that. So yeah, I really appreciate what Francis Lawrence did with these books. The last three movies are seriously the best adaptation of a book I’ve ever seen, and I’ve seen plenty. So props for that. The writers did a good job, too. The dialogue is great, although it feels a bit forced at times – but that gets us back to the pacing issues. And I felt like some of the dialogues were forced in the book, too. Now, the acting. Everyone did an amazing job – and I really do mean everyone. There wasn’t one character where I thought that the actor only did an okay job, or where it felt like the actor was lazy or not completely in character. Jennifer Lawrence was incredible, of course. 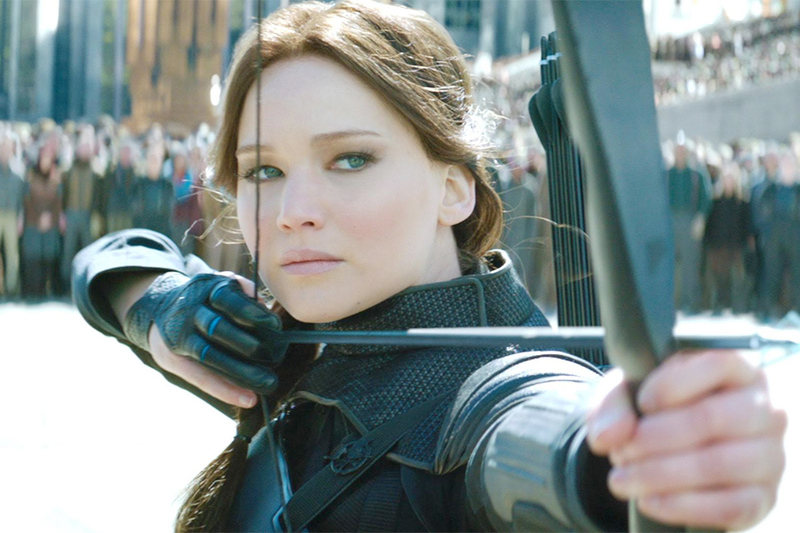 In the book, there’s a lot of internal monologue, and most of it really goes on in her head, which you can’t always transform for the big screen – but Jennifer Lawrence is such an amazing Katniss that you can see in her face what Katniss is thinking. And if that’s not fantastic acting, I don’t know what is. Josh Hutcherson was brilliant, too. 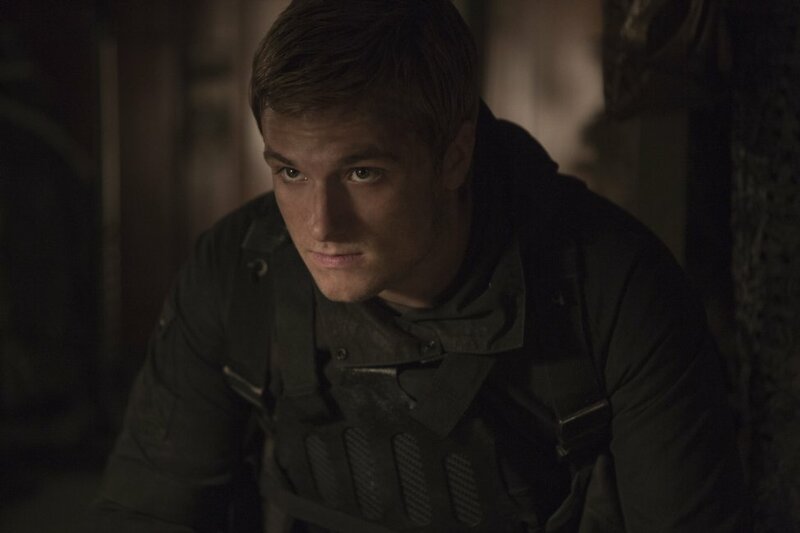 The whole highjacking business doesn’t feel like he’s forcing himself to do something he doesn’t know how to do – Josh does an amazing job at portraying Peeta‘s journey, the process of slowly figuring out how to navigate reality and what to do when he starts to realize that he can’t and that the highjacking is taking over. I loved how Josh gave Peeta life throughout these movies, and I was really impressed by his performance in this movie in particular. You can see in his eyes whenever Peeta is losing his grip on reality again, even before he starts to act on it, and that’s amazing. Everyone else was incredible too, but if I list everyone, this post would turn into a book and no one would even want to reach the end of it. So I’m just going to say that I loved everyone in this movie – or hated, depending on what I was supposed to feel – and that’s how it’s supposed to be. Every single one of the actors went that extra mile that doesn’t make a movie feel like a movie, but makes you forget reality around you and just pulls you in. Does that even make sense? I might have lost track of my thoughts and sentence there… If it’s unintelligeable, I apologize. Fatigue does weird things to my brain. The action sequences were fantastic, and the effects of the pods where stunning. The mutts were really scary, too – and didn’t look at all like what I was expecting. I do have a couple of issues with this movies. The pacing, for one, but like I said, that’s mostly on the book. Then there’s the fact that I didn’t agree with Katniss just magically healing – I mean, I know that the Capitol has great medical resources, but Katniss still got burnt badly. And yet, she doesn’t even have a scar on her (granted, we only see her fully clothed, but didn’t she also burn her face and her hands?). 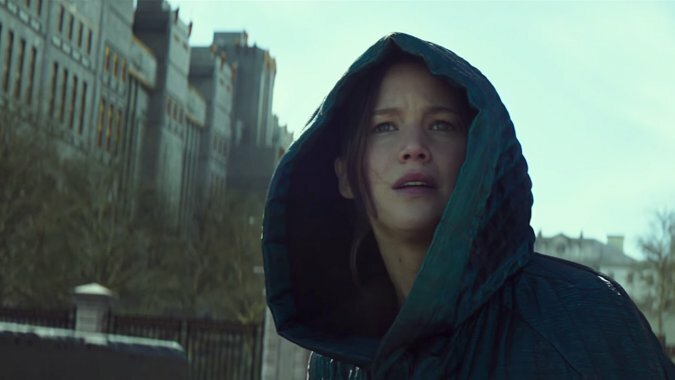 They skipped Katniss trying to starve herself after killing Coin, which I kind of get because it would have coniderably stretched out the movie and slowed it down, but I feel like it was also an important part of the story. And the ending was super cheesy. They changed that a bit too, but they kinda had to, given that’s it’s nothing but internal monologue. 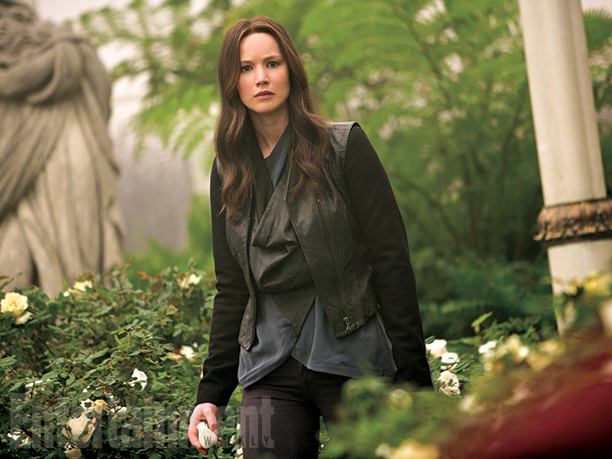 But the lighting and Katniss’ dress made it feel like a weird dream. And cheesy. Mostly cheesy. And – I’m not sure this is really an issue -, but Effie wasn’t really in the book, so her presence alone felt like fan-service. But at the end, she and Haymitch kiss – and that, my friends, was most definitely the most fan-service-y thing I’ve ever seen. Not that I’m complaining, because I’m not. I just needed to say it. What else..? Ah, yes, the deaths. There’s quite a few of them, as anyone who’s read the books might know. I tried to prepare myself for them, because I knew it was going to happen, but I really wasn’t prepared. Finnick‘s death was horrible, and Prim‘s death… Well, Prim’s death killed me when I read the book. The movie didn’t change that. But even worse than the fact that Prim dies was Katniss’ reaction to it. 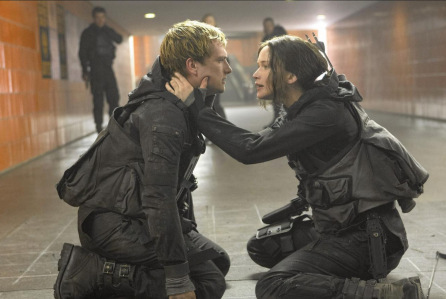 There’s this scene, it’s in the book, too, when Katniss comes home to District 12 and Buttercup is there and Katniss has a breakdown – I started crying like a baby. Jennifer Lawrence really is amazing. I think that’s it. If you have anything to add, or if I’ve forgotten something or you just want to say something about the movie or this super long review of it – go ahead! We’d love to hear your thoughts! Okay, now, the rating. I’m not going to give it an outstanding, because, although I loved this movie, it wasn’t as good as the last one (and Catching Fire is still the best one of the series, but it’s the same for the books). But I loved this movie despite what small issues I had with it, and I feared that it might be worse than it was because there’s so much going on in the book that I thought they’d cut out too many things, which they didn’t. 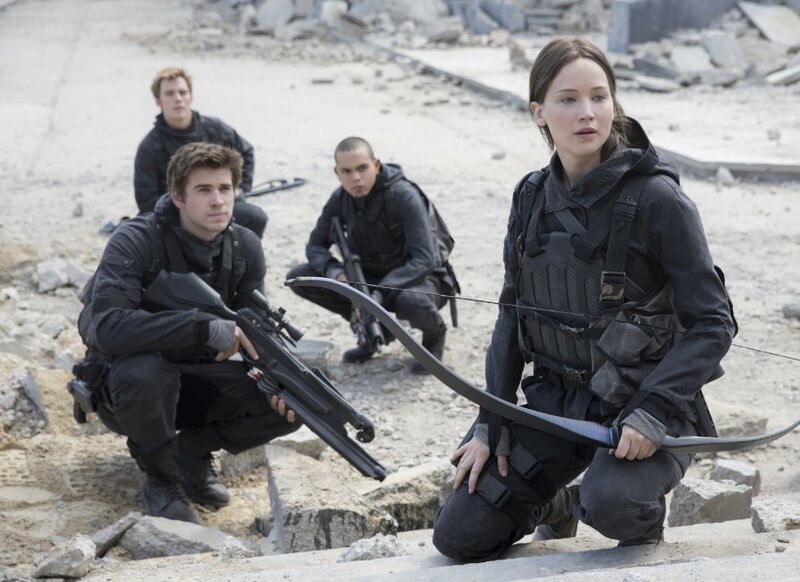 So The Hunger Games: Mockingjay, Part 2 gets an Exceeded Expectations from me. I would recommend it to everyone, but I don’t think I have to, because if people who liked the movies stuck around long enough to watch Part 1, I’m pretty sure they won’t need anyone’s recommendation to go watch Part 2. And if you haven’t seen any of these movies – what the hell are you waiting for?